“When Stephane told me he had written much of this EP using his own software, that he had collected samples from all over the globe (Brighton, Manchester, New York, Bangkok, Bremen, Berlin…) and that he chose to use only these samples and the analogue instruments he plays to compose the EP, I knew I was in for a treat. Spheric, dreamy, wrapped in a warm blanket. 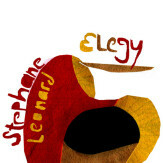 That’s how the new release by Stephane Leonard is stepping out into these cold winter days. After releasing his impressive third solo EP ‘bon voyage’ on plakatif.net Stephane’s back with four sophisticated tracks. ‘Elegy’ – released on serein.co.uk – is merging field recs taken from all over the globe into a unique atmoshere that accompanies the days with great awareness. Out of his self coded max-msp software four sensitive universes stream which every time you listen to them expand further into the realms of imagination and thus take precise looks at the nature of the world around us. Humane universes that at no point tend to being soaked up by the golden showers of modern consumerism. With the perfectionists love to detail Stephane’s sounds build bridges which hold for even the lost of characters. These elegies find soul in the bowels of the great machine.